Season 9, Episode 8: It’s made of people! Magna and Yumiko take on a new foe. Each week, we comb through the guts of The Walking Dead, much like a horde of hungry walkers, to bring you the episode’s best moments, surprises, and other post-apocalyptic curiosities. This week: The group goes to a graveyard, Negan loses his ball, and someone has to hose down a pig. Biggest missed opportunity: This week’s episode brought a genuine sense of horror back into the show, along with reason to fear walkers. Too bad this story didn’t air closer to Halloween. Creepiest prop: But go figure, the scariest thing about an episode with talking walkers is the clown alarm clock Daryl throws to distract the herd. Most frustrating question: We know that something happened between Alexandria and the Hilltop, something that involved Michonne and Maggie, but what exactly that was still remains a mystery as the show heads into winter break. And there really haven’t been that many clues dropped to let viewers speculate what caused the rift. Instead, we’re just left puzzled by characters who used to care about each other (like Michonne and Tara) now being cold to each other. Here’s hoping we get a resolution quickly in the second half of the season. Best foreshadowing: Sitting in his jail cell, Negan kept tossing a tennis ball against the wall, an homage to The Great Escape. Best trainer: As Daryl tries to divert the herd by tossing firecrackers at them, Dog starts barking, further helping draw the herd toward Daryl and away from Jesus, Aaron, and Eugene. But when Daryl notices the herd acting odd, he silences Dog instantly with a wave of his hand. We’re patiently awaiting the Daryl the Dog Whisperer spinoff. Longest wait: How have we gone nine seasons without a battle in a proper graveyard? 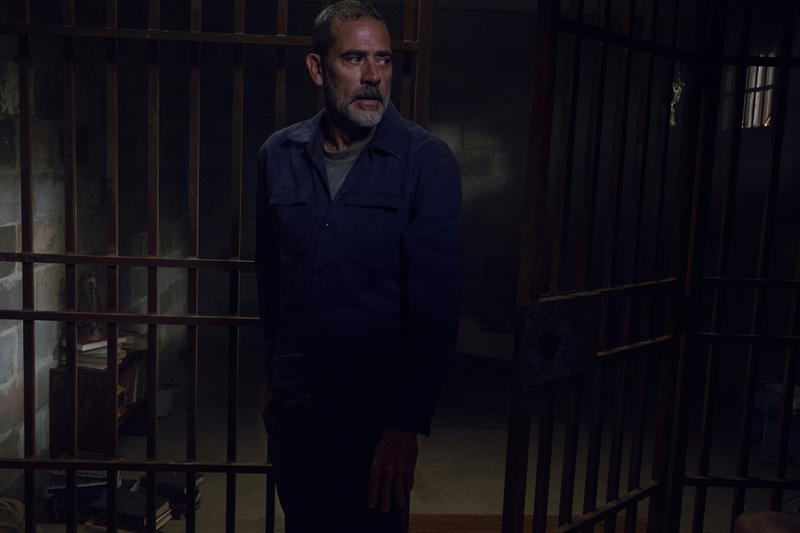 Second longest wait: Honestly we’re just amazed that it took seven-ish years before someone forgot to lock Negan’s cell, literally the only containment measure on this prisoner-for-life. Negan makes his great escape. Most resourceful: Luke can rest easy that in Hilltop, at least, love of music is alive and well, as evidenced by the drum set fashioned out of barrels that you can see in the background in the teens’ hangout spot. Least changed from pre-apocalypse: Even when the dead rise and walk the earth, teenagers will still be stupid, stupid teenagers. Most useful: Anyone else notice that a walker chomped down on Aaron’s metal arm during the cemetery fight scene? Prosthetic limbs come in handy in zombie battles. Most disturbing image: A Whisperer’s murder of Jesus. Even while knowing the comics-based story of the Whisperers, we weren’t ready for that dodge and recover-for-the-kill move. Perhaps it was the fog, or maybe the graveyard that set the scene perfectly, but either way, the tension was amplified and the death of the fan-favorite, kung fu-practicing Hilltop leader was unexpected. For those that didn’t know what the Whisperers were about, this had to have been an iconic moment (even if it was one that none of us wanted). By the way: Jesus’s untimely demise was actually suggested by actor Tom Payne, who was upset with the sidelined direction his character had been given over the past few years, he confirmed in an interview with Entertainment Weekly. To break up the boredom, he wanted Jesus to go out in a blaze of glory. Best kill: Before his death, Jesus had his own final, epic, slow-motion zombie-killing scene, just to remind us that we were losing a heck of a warrior. 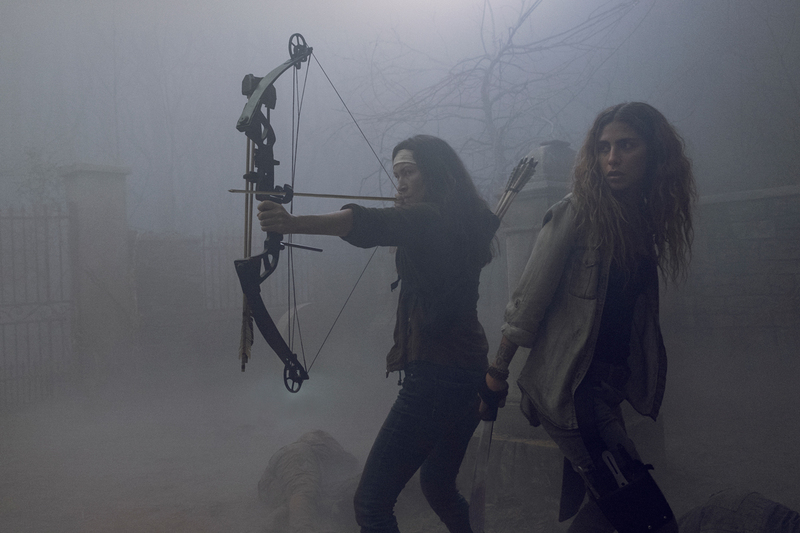 Episode MVP: Magna and Yumiko, for coming out with Michonne (all three of whom seemed to just appear out of thin air) to help save Aaron, Jesus, Eugene, and Daryl, even though they don’t really know this team and probably could have “earned their keep,” as Tara told them they’d have to, in a less potentially lethal way. Hopefully this earned the newcomers some brownie points. Episode Least Valuable Player: Gabriel, after reverting back to his plot-forwarding, lackadaisical ways. Worst. Guard. Ever.